To increase the service life of electric motors and at the same time to optimize the current feed to the commutator, the wear of carbon brushes and the service life is tested right at the development stage. The measurement takes place at the end of the brush and acquires the up and down movements of the brush which represent a decisive criterion at high rotational speeds. Due to the non-contacting measurement principle there is no influence due to mechanical probing. As a result the user obtains a true, undisturbed signal trace. 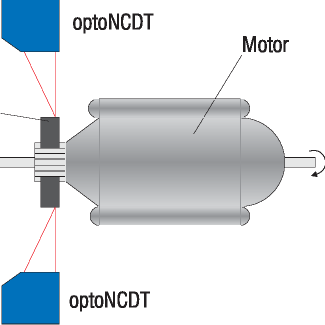 The wear measurement takes place on the test rig using laser triangulation sensors of the Series optoNCDT. The measurement system consists of two laserbased optical displacement sensors which are ideally suited to the measurement against dark and also shiny surfaces. The carbon brush does not need to be modified for the measurement and coating of the end of the brush to improve the reflective properties is not necessary.